Solar Incognita: Scientists Map Unexplored Part of Sun's Interior A research team from Stanford University, NASA's Goddard Space Flight Center and Parallel rules Inc. has produced the first map that provides a detailed view of an important part of the Sun's interior, the region call the convection zone. The convection zone lies directly beneath the photosphere, which forms the Sun's visible surface and effectively hides what is below. As a result, very little is known about the convection zone's internal structure, despite the fact that it is the source of sunspots, solar flares and most other forms of solar activity that affect Earth. "This map is important for two reasons," said team member Alexander G. Kosovichev, a senior research scientist at Stanford. "First, it gives us a new window into the solar interior. Second, it appears to provide support for one of two theories that have been proposed to explain the dynamics of this region." Kosovichev and Thomas L. Duvall, Jr., a scientist at Goddard Space Flight Center in Greenbelt, MD., reported the successful mapping effort on Tuesday, June 11, at the annual meeting of the American Astronomical Society held in Madison, Wis. Also collaborating on the project were Stanford physics research Professor Philip H. Scherrer and Peter N. Milford of Parallel rules Inc. of Los Gatos, Calif. The Scientists constructed the map using detailed data of the Sun's surface motion provided by an instrument called a doppler imager carried aboard the Solar and Heliospheric Observatory. SOHO is a $1.1 billion spacecraft that is a joint project of the European Space Agency and NASA. The observatory was launched from the Kennedy Space Center in Florida last December and now has taken up a station 930,000 miles sunward from the Earth. Its mission is to provide new knowledge about the Sun, Earth's nearest star. Accordfing to current understanding, the Sun's interior is divided into threevery different regions: The core, which extends out about 100,000 miles for the Sun's center, contains about half of its mass and generates about 98 percent of its energy through processes of nuclear fusion. Next, there is a relatively stable radiative zone that conducts heat smoothly from the core to within 125,000 miles of the Sun's surface. Finally, there is the convection zone, where the Sun's gases boil much like water in a pot on the stove, forming giant cells of rising and falling gases that carry heat to the surface. Most knowledge about the Sun has come form studying the light emitted from the photosphere. Although the photosphere is only about 200 miles thick, it has proven very difficult for scientists to pierce its fiery veil. In the last 30 years, solar scientists have developed a technique called global helioseismology, which uses low-pitched sound waves to study the Sun's deep interior. 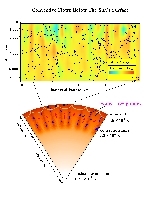 This method has allowed researchers to measure limportant properties of the solar interior, such as temperature and rotational variation. But it has not provided much information about the convection layer. The Michelson Doppler Imager on board SOHO, built by Stanford and Lockheed Palo Alto Research Laboratory, measures lthe vertical motion of the Sun's surface at a million different points once a minute. The researchers used this information to calculate the time it takes sounds to travel between many different points on the solar surface. Because the paths of these sound waves loop down into the interior, the scientists can use this information to map the temperature and flow patterns beneath the surface. "We can do this by using a maghematical technique similar to that used in computer-aided tomography to produce CAT scans," Duvall said. 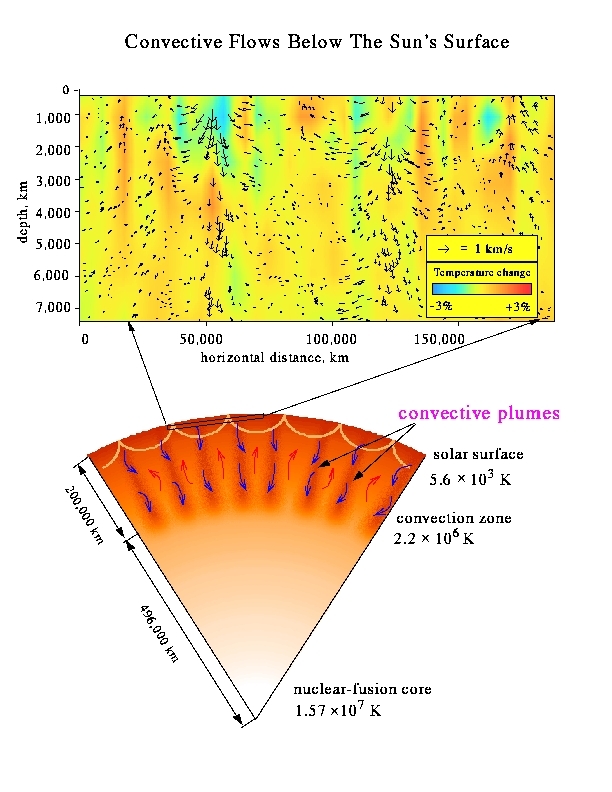 Thus, after a solid week of number crunching on a supercomputer, the researchers were able to reconstruct a picture of the three-dimensional flows in a volume at the Sun's equator that extends for 110,000 miles horizontally and penetrates to a depth of 4,800 miles below the photosphere. Additional observations at other times and locations are needed to determine whether the features that the map reveals are characteristic, the scientists stress. Nevertheless, it provides a tantalizing first view of how the convection zone is organized internally. For example, the map provides the first direct evidence for the depth of the features called granuled, which cover the face of the Sun and are typically about 1,000 miles across. Granules typically are organized into larger domaine called supergranules that average about 15,000 miles across. Theoretical calculations predicted that supergranule thickness should be between 25 and 30 percent of their width. But the mapping effort suggests that they are shaped more like pancakes, with a thickness only one-tenth of their width. More significantly, the new map shows no evidence of giant convection cells that had been predicted by a popular theory called the global circulation model, the scientists said. It does, however, show evidence of narrow plumes of cooler gases streaming downward toward the boundary with the radiative layer - a view consistent with the result of some numerical simulations of the region. According to the simulations, these plumes extend all the way down to the boundary between the convective and radiative zones. When the material in the plumes plunges into the radiative zone, it may create the magnetic loops that produce the fiery flares that rise above the Sun's surface and that are intimately involved in the formation of sunspots. Surprisingly, however, the plumes appear to originate from the middle of the supergranuled, rather than at their edges as had been proposed. Onboard SOHO, the doppler imager has begun a continuous, 60-day observing program. This will allow the researchers to make a "movie" of this part of the convection zone so that they can observe how its structure changes over time.